In 2015, we mapped surface and near-surface physical properties of a Paleo-Inuit lithic quarry site, LbDt-1, located in the interior of southern Baffin Island, Nunavut, Canada using a multi-method approach. The survey site is characterised by a dense chert flake deposit. The purpose of the survey was to document this survey site’s surface features using three-dimensional laser scanning and to investigate the utility of active remote sensing and geophysical methodologies at prehistoric lithic quarry sites. Manual and automated data reduction, interpretation and inversion methods were applied across each dataset to isolate the surface and subsurface distribution of flakes. Laser scanning results demonstrate a remarkable dispersal of surface chert flakes confined to a general area of the geophysical survey. To define the base of the lithic deposit layer, a combination of enhanced radar reflections and two-layer inversion models of magnetic responses obtained using electromagnetic measurements was used. Radar results suggest the deposit has a thickness of around 10–20 cm and indicate that there are no additional parts of the deposit masked by soil in this area. The magnetic susceptibility data define an upper layer of ~ 20 cm thickness and susceptibility (0.004–0.008 SI) overlying a less magnetic (< 0.004 SI) lower layer, with the spatial variations in the upper layer suggesting debitage and gravel deposits have lower magnetisation than the topsoil at the site. 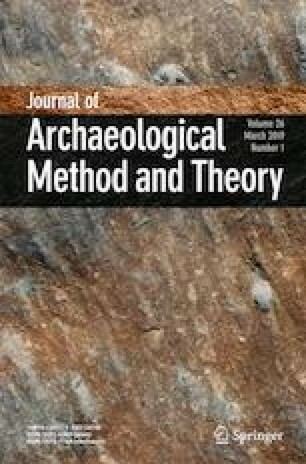 Overall, this study demonstrates the capacity of remote sensing and geophysical methods to non-invasively investigate some prehistoric activities without the need for full-scale excavation and the collection of large material assemblage characteristic of lithic quarry sites. The authors gratefully acknowledge contributions to this research from the following people: Douglas Stenton (Department of Culture and Heritage, Government of Nunavut), Reid Campbell (University of Manitoba), Rick Armstrong and Mary Ellen Thomas (Nunavut Research Institute, Iqaluit, NU), L. Conyers and two anonymous reviewers. Funding support for this research was generously provided by the Social Sciences and Humanities Research Council of Canada’s Insight Grant Program (No. 435-2012-1176; Milne, Fayek, Park, Stenton), the Canada Foundation for Innovation—John R. Evans Leaders Fund Project (No. 25071; Milne), the Manitoba Research and Innovation Fund (Milne), the Manitoba Heritage Grants Program (No. 12F-H145; Milne), the Social Sciences and Humanities Research Council Doctoral Award (Landry), University of Manitoba Graduate Fellowship (Landry), Northern Scientific Training Program (Landry), the University of Manitoba, Faculty of Graduate Studies SSHRC Graduate Enhancement of Tri-Council Stipends Scholarship (Landry) and the Polar Continental Shelf Project (Natural Resources Canada, Earth Sciences Sector Project No. 647-13). Dafflon, B., Hubbard, S. S., Ulrich, C., & Peterson, J. (2013). Electrical conductivity imaging of active layer and permafrost in an Arctic ecosystem, through advanced inversion of electromagnetic induction data. Vadose Zone Journal, 12(4). https://doi.org/10.2136/vzj2012.0161. Isenburg, M. (2015). LAStools efficient tools for LiDAR processing. (Version 1.3). Retrieved from http://lastools.org. ten Bruggencate, R. E., Milne, S. B., Fayek, M., Park, R. W., Stenton, D. R., & Hamilton, A. C. (2016a). Characterizing southern Baffin Island chert: a cautionary tale for provenance research. Journal of Archaeological Science: Reports. https://doi.org/10.1016/j.jasrep.2016.03.016.